Did you know that the stethoscope is now 201 years old? It was invented by Rene Laennec in Paris in 1816! The stethoscope is an incredibly basic contraption, having a cone shape with one end larger than the other so that the sound is amplified. Version 1.2 (left) and maybe you could say we are currently up to Version 1.3 (right). The stethoscope allows you to hear sound only and so crackles, a wheeze or breath sounds that are either louder or softer are the only findings. In a study that was performed at Royal Melbourne Hospital, and consistent with extensive literature, clinical examination alone using a stethoscope or a plain chest x-ray had a high specificity but are low sensitivity. And to quantify the findings was poor. What this means was that when the clinical pathology, such as pneumonia or a pleural effusion, was very severe and could be detected clinically, that this diagnosis was quite accurate. The main problem was that either chest x-ray or clinical examination was very poor and picking up minor or moderate degrees of pathology and when something was detected it was very poor at quantifying its severity. Very inaccurate. Lung ultrasound is the answer. The common belief is that the lungs full of air, an ultrasound does not penetrate air, therefore lung ultrasound is a waste of time. In the setting of completely normal lungs of course very little can be seen but when there is significant lung pathology, then there is less air, or even no air, in the lung and so there is often very good imaging! And it is very simple and easy to learn as a technique. There are only three areas of the chest to scan. The anterior chest (upper lobe), and the back (upper is upper lobe, and lower is lower lobe). Simple! What pathologies can you see? You can easily see the location of the diaphragm, whether the lungs fully inflated with air or not, pleural effusion, lung collapse and consolidation, pulmonary oedema and pneumothorax. This patient was six weeks after cardiac surgery and had complied with all of his physiotherapy and had been very active in his rehabilitation. 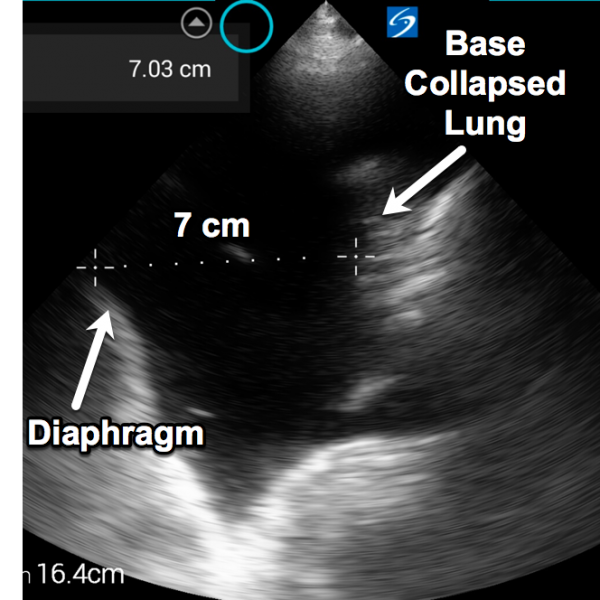 Despite this, this ultrasound shows the diaphragm on the left of the screen, the heart is seen in the distance at the bottom right of the screen, the black area is the pleural effusion and the wedge-shaped piece of tissue is the collapsed left lower lobe which has lost its volume because the air inside the alveoli has been absorbed into the bloodstream. The lungs now looks like soft tissue because it no longer has any air in it and all of the alveoli I collapsed which results in the smaller size of the lung. Taking this distance in centimetres, multiplied by 200, then gives you the volume of the pleural effusion plus or minus 10% in its accuracy. To quantify the pleural effusion, a measurement is taken from the diaphragm to the lung where the collapsed lung segment joins the remainder of the lung. This is the intercostal catheter bottle where 1435 mL drained within 15 minutes, and a further 80 mL drained over the next 24-hours. Notice that the suction is placed on maximum (40 cm of water) which further facilitates lung expansion. This video demonstrates the diaphragm and the spleen on the left half of the screen and the air artefact of the inflated lung moving left to right as the diaphragm moves up and down with respiration. This is a fully inflated lung and therefore, we did not need to perform a chest x-ray which meant the patient got no radiation. And what’s more, when we removed the intercostal catheter we performed another ultrasound to check that the lung remained fully inflated and again did not need to give the patient any radiation. So why should a medical student have lung ultrasound training mandated? So what do you think? Should the medical students be trained and ready for this technology?